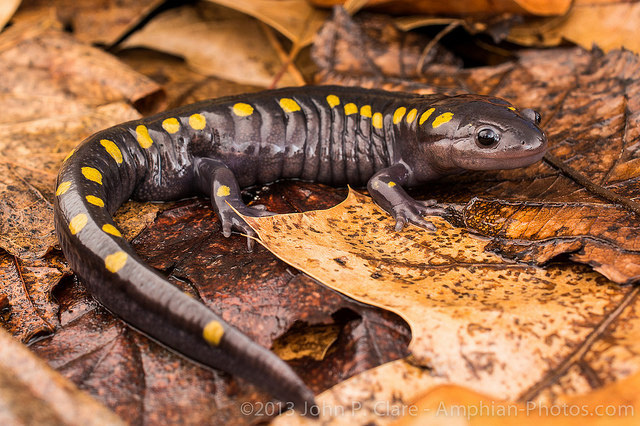 Spotted salamander (Ambystoma maculatum); ; photo by John Clare on Flickr (noncommercial use permitted with attribution / no derivative works). The spotted salamander (Ambystoma maculatum) was designated the official state amphibian of South Carolina in 1999 after a campaign by the third grade class at Woodlands Heights Elementary School in Spartanburg. 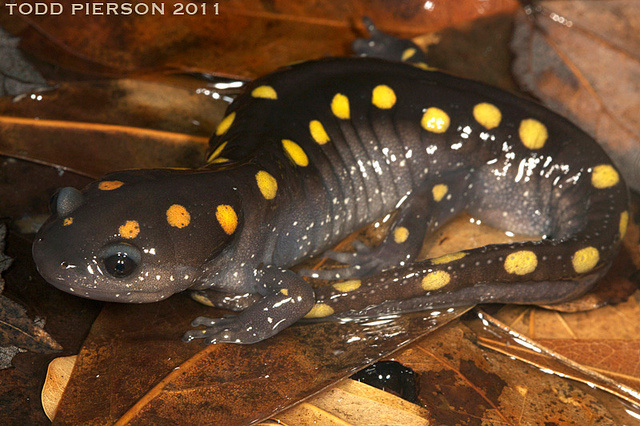 The spotted salamander is also a state symbol of Ohio (all state amphibians). A stout-bodied amphibian identified by bright yellow round spots in two irregular rows on a dark background, the spotted salamander is 150 to 249 millimeters in length (5 - 10 inches). The spotted salamander is the only amphibian indigenous to the entire state of South Carolina. Spotted salamanders inhabit deciduous forests with semi-permanent pools about one meter deep - they avoid bottom-lands that are subject to regular flooding and permanent ponds that contain fish. Spotted salamander (Ambystoma maculatum); photo by Todd Pierson on Flickr (noncommercial use permitted with attribution / share alike).